View The Highlights & Photographs From This Issue. Reels or yarn winders, tools for measuring spun yarn into a skein of a consistent size, are much more varied structurally than spinning wheels. 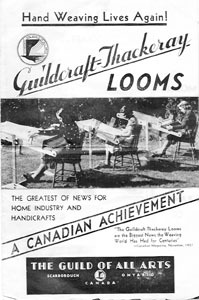 In this issue we will learn about some made by a Canadian wheel maker. We are shown how a reel that makes a standard-size skein had been engineered to be more compact. Sometimes popular wheel structures are simplified. We will look at an example known to be from Sweden. Another one, in the Norwegian style, contains a surprising amount of metal. 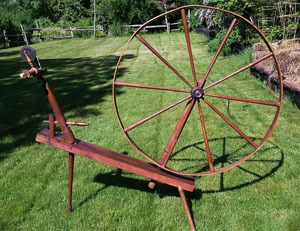 Over the last few years Gordon Moat has become an expert on identifying the woodworking style of the spinning wheels by Horton Row from Kemptville, ON. He recognized Row’s style on a reel that accompanied a great wheel. Further study uncovered a half dozen other examples of similar reels, and at least one has Row’s stencil. While checking out a great wheel that he thought was by Horton Row, Gordon found that it was signed “R. H. ROW/ PEMBROKE.” The maker, Reuben Row, was a younger brother of Horton Row and was listed as a carpenter in the Pembroke, ON, census as late as 1901. Although the reel that Eugene Klingshirn found made a 40-yard skein, it was much lower and more compact than most of the ones he had studied. He explains how it was cleverly constructed to handle the correct amount of yarn but still occupy less space. Karin Lowe has always treasured the spinning wheel that she inherited from her Swedish immigrant great-grandmother. While it looks similar to a standard wheel, it has several unusual features. When she asked about it on Ravelry, she learned there were a few other examples. One of the examples belongs to Sheila MacIsaac who describes her wheel, which is a close match to Karin’s and other Scandinavian wheels with turned tables. At first glance the spinning wheel Rosemary Papp found looks like the structure we have been calling Norwegian with a secondary table holding the mother-of-all. But on closer inspection she learned that it is a simplified version of that style with more metal components than is usual on spinning wheels.